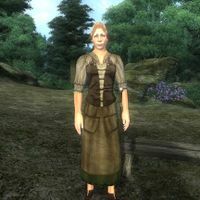 Francine Velain is a Breton commoner who is a devout worshipper of the Daedric prince Nocturnal, and can be found with her fellow worshippers Mor gra-Gamorn and Dhola at Nocturnal's Shrine. She will never break her vigil of Nocturnal's Shrine and will spend day and night worshipping at the shrine. She prefers to sit on one of the benches, listening to the sermons randomly performed by Dhola from behind the lectern. At other times, she will get up and wander aimlessly around. In combat, she relies on an iron dagger. She wears a shirt with suspenders, green felt linen and rough leather shoes. Francine Velain plays no notable role in the Nocturnal's Shrine Quest, though she does comment on your progress through it. If you speak to her before you begin the quest, she will say, "We are not afraid of the dark. The Night Mistress gives us eyes to see night's secrets." This page was last modified on 20 October 2015, at 05:27.